Our law firm is full-service and robust. We serve clients throughout the New Jersey-New York metropolitan area with personal attention and commitment. At Ehrlich, Petriello, Gudin & Plaza, our New York office is focused on commercial litigation and business transactions, including real estate, condominium law, taxation and debt collection. We have grown since 1955 to become a premier mid-sized law firm. Our size enables our attorneys to be nimble and versatile in serving our clients' best interests. Our dedication to highest quality service and representation is structured with your needs and objectives in mind. At Ehrlich, Petriello, Gudin & Plaza, we serve individuals, small businesses, large corporations, publicly traded companies and government agencies. Our experience and our history have built foundational excellence to serve this diverse clientele. Our attorneys are active members of state and local bar associations, and they invest time within industry groups and local governments to help shape policy and keep our clients informed. Several members of the law firm have been listed in Super Lawyers, reflecting the achievements and reputation we uphold on a daily basis. Our approach to commercial litigation is centered on prudent decision-making to lead to effective results. We discuss alternative dispute resolution (ADR) compared to judicial litigation. The efforts we advocate with ADR typically resolve disputes quicker and more amicably when parties meet to hash out differences. Our clients save time, money and resources while we counsel them through and lead the process. This is one approach to commercial litigation and business dispute resolution with several options, but we are also extensively experienced at trial. We will work together to determine the best strategy and tactics for achieving favorable results in your particular situation. Founded in 1955, the firm has grown in diversity of practice areas and accumulated experience to become one of the premier mid-sized law firms in the New Jersey-New York metropolitan area. Ehrlich, Petriello, Gudin & Plaza has been providing aggressive representation in federal and state courts in New Jersey and New York for more than 50 years. We work hard to protect the rights of our clients. 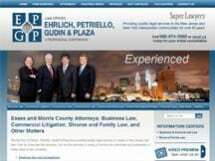 At Ehrlich, Petriello, Gudin & Plaza, we have been serving clients in the areas of business and commercial law for over 50 years. The complexity of commercial litigation requires seasoned commercial litigation attorneys. In addition to divorce, our family law practice also includes separation agreements, prenuptial agreements, post-nuptial agreements, etc.